We are pleased to share you the first official images of the stunning new Princess S72 as she makes her world premiere at the Miami Yacht & Brokerage Show. You can see the S72 on display on the Princess stand at Ramp 33 between the 4200 and 4300 Blocks of Collins Avenue until the 17th February. Last night the S72, the first of the new range of Princess S CLASS Sportbridge yachts, was officially unveiled at the 2014 Miami Yacht & Brokerage Show. VIP guests and the world’s press attended an evening of cocktails and music with Purobeach supplying plenty of Latin cool courtesy of world famous saxophonist, Florencio Cruz. Princess Managing Director, Chris Gates, welcomed guests, announcing that there will be more S CLASS models on the way and thanking our distributors across North, Central and South America who have been so much a part of the Princess success story. The S72 dazzled it's audience on the night. Her sleek, dynamic exterior lines, finished in a metallic aluminium hull colour, shimmering against the Miami waterfront. The S72 will be on display at the Princess stand, Ramp 33 between the 4200 and 4300 Blocks of Collins Avenue, until the 17th February. 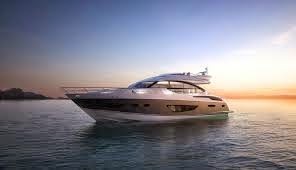 Princess Motor Yacht Sales are the largest boat trader and distributor in the world for the Princess range of Luxury Yachts. We have been a boat trader specializing in the Princess marque since 1964. To knowmore about Princess Yachts, please feel free to contact us by either telephone or e-mail. Good Information... what is the price of Princess S72 in India.